Today, mobile is a very common object and that's why Mobile frameworks are in very much demand. In this post, I will show you brief walk through of 2 most popular jQuery based mobile framework "jQTouch" and "jQuery Mobile". And I will also explain the differences between "jQTouch" and "jQuery Mobile". First thing I want to clear about jQTouch is that "It is not a framework". Its a myth that it is a framework. (Though I have also mentioned earlier in my post, but that's a myth) jQTouch is a jQuery plugin for mobile web development on the iPhone, Android, iPod Touch, and other forward-thinking devices. It supports minified code, native WebKit animations, swipe detection, auto list navigation, flexible themes, has the ability to be tweaked with custom extensions. jQTouch is built by David Kaneda and maintained by Jonathan Stark. jQTouch is focussed strictly on the iPhone, iPod Touch, and soon, Android. jQTouch progressively enhances HTML and CSS, so that less capable phones are still be able to browse content. jQuery Mobile is touch-Optimized Web Framework for Smartphones & Tablets. A unified, HTML5-based user interface system for all popular mobile device platforms, built on the rock-solid jQuery and jQuery UI foundation. Its lightweight code is built with progressive enhancement, and has a flexible, easily themeable design. jQuery Mobile is built upon standard, semantic HTML, allowing pages to be accessible to the broadest range of devices possible. For A-Grade browsers, many of the components in jQuery Mobile leverage techniques such as focus management, keyboard navigation, and HTML attributes specified in the W3C's WAI-ARIA specification. As I have stated earlier that jQTouch is not a framework, it is plugin. Where jQuery Mobile is framework created for Mobile and tablet devices. jQTouch is optimized for WebKit.Therefore jQTouch might be preferable if you plan on specifically targeting users tied to an iOS- or Android-based device. Where jQuery Mobile is compatible with all major mobile and tablet platforms. jQTouch provides access to Geolocation (Access to device GPS Data) where jQuery Mobile doesn't provide this hardware access(to date). jQTouch is focused on small screen devices. From their blog. "Apps developed with jQTouch will certainly run fine on iPads and other tablet devices, but we aren’t going to automagically convert to a more tablet-friendly UI that takes advantage of the additional real estate." In terms of performance jQTouch is better than jQuery Mobile. If you are targeting only Webkit devices then go for jQTouch. Though jQTouch project is technically active, the original author has moved on and development seems to have slowed where jQuery Mobile Announced in August 2010, it’s quickly progressed to a very functional Alpha 2. 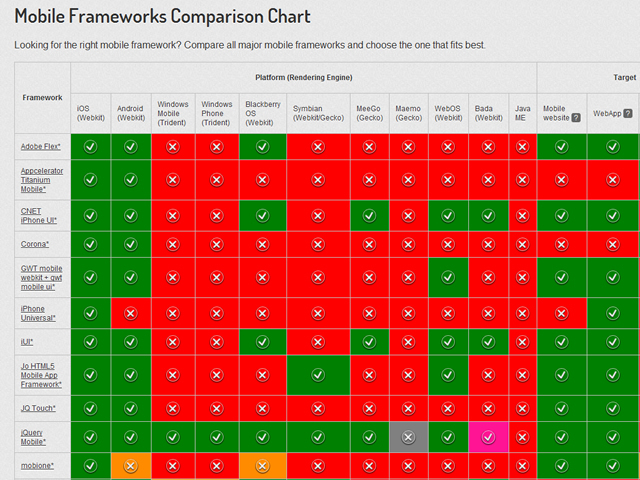 This guy named "Markus Falk" has created a frequently-updated chart that shows of pros and cons of all the mobile frameworks out there. The chart displays the rendering engines supported, target platform, hardware, development languages, license and UI features for each framework. Plus, it also has a wizard feature which allows to filter the framework based on various functionality.